Interestingly enough, the arrival of the first Pentecostal missionaries to Bulgaria was not associated with starting new churches. Neither was it purposing a takeover of existing protestant congregations or the traditional for Bulgaria Eastern Orthodoxy. First Pentecostal missionaries Voronaev (far left) and Zaplishny served as a pastor in the United States, but their goal in Bulgaria was to preach Pentecost in already established churches. Zaplyshny’s wife Olga, who was from Bulgaria, enjoyed her home church which was more than sufficient for the hand full of believers. It was common in 1920 that whole congregations of traditional protestant churches in Bulgaria would convert to Pentecostalism. 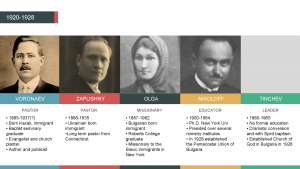 However, it was not until almost a decade later when in 1928 the nephew of Olga Zaplishny – Nicolas Nikoloff who was educated in the States was sent by the Assemblies of God to organize the Pentecostal movement in Bulgaria. Initially only 7 congregations agreed to his proposal to be included into the new Pentecostal Union and registered with the government. They were predominantly in Southern Bulgaria around the city of Bourgas where the Zaplishny family settled and labored. The rest remained under the leadership of Stoyan Tinchev (far right) calling themselves Free Church of God. They later formed churches in North Central Bulgaria, near the city of Varna where Voronaev resided. Less than a decade old, the Bulgarian Pentecostalism movement split between the churches that registered with the government and the churches which refused to register. There were some later differences in their view on sanctification, Baptism with the Holy Spirit, leadership and organizational structure. Nevertheless, the preaching of Pentecost became the entry point for Spirit baptism among mainline churches and new converts.